New member checking in. Getting back into BE shooting after laying out for about 10 years. Placed the order, this week, for a new Clark custom hardballer. My goal is to become EIC Distinguished in both rifle and pistol (currently not distinguished in either) and since I'm nearing retirement, I should have plenty of time to get that done. Living in far western KY, I'd like to hear about places to shoot BE in the region. I'm familiar with the Southern IN R&P and Memphis Shooting Sports clubs. Are there any others in western TN, southern IL, or SE MO? He reports on matches in and around Missouri. New member just sayin' Hi. I've been competing with a handgun (revolver, mainly) for 4 years, and thought I'd give bullseye a whack soon to round out my handgunning skills. I've been practicing with my MkIII/UltraDot, and assuming I still have .22LR ammo when the season starts this spring , I plan on shooting some local matches then. Thanks for a terrific & helpful BE forum! New member checking in. Our gun club in Charleston just started Bullseye comps and I'm looking to get involved. I've been shooting Highpower and USPSA for years, but this is my first venture into target pistol shooting. I've got some gunsmithing experience and plan to get a Caspian matched set to build a Hardball style gun that I can use in the military EIC matches. I'm actually out of the states for a few months, so it should give me time to get the components together to start building for the spring. Len VanCurler checking in. It is nice to find a group of people that love this sport. It's cold and wet here in Oregon but we managed to get a 2700 in last weekend. Scores..Did I mention that it is cold and wet here? Welcome. I just started shooting bullseye last winter. Started out having trouble keeping 10 rounds on the target, not within the scoring rings, not even on the paper! It has been a blast and I did improve. What helped me was signing up for a couple of leagues. I got to shoot with people who could help me and for me an organized and friendly competition atmosphere works the best. You also get to meet some really nice people. Brand new to the sport, but have been interested in getting involved for awhile. I currently live in North Carolina, specifically near Fort Bragg. I'm interested in CMP/Service Pistol BE and am looking for a club or someone who lives nearby that wouldn't mind showing a rookie the ropes. I'd like to give the sport a shot before investing a lot of time/money. I'm in the military, so I'm quite familiar with firearms, just not the sport of BE. Shoot me a PM if anyone is willing and interested. Thanks a lot and I hope to learn a lot here. Hi everybody, I've not shot much for several years and am just starting to ramp up and start competing again. So if I ask a silly question please keep this in mind. I've been lurking for a while but I'm a new-ish shooter (started Bullseye in Fall 2013) in the Navy and just completed my first matches Atlantic Fleet and All Navy matches in Quantico, VA. Needless to say I've got the bug! I had my own hardball pistol built a couple months ago and have a marvel 22 conversion on the way, and see many matches in my future. Thanks to all the members of the forum for the wealth of knowledge on this forum, I've learned a lot and look forward to learning much more. Just found the forum and signed up. Glad to be part of the Bullseye community and forum. Anyone know of any clubs shooting bullseye in Central Florida? Seems like most of the clubs are into IPS or Combat style competitions. There may be others but Jacksonville and Pensacola have BE programs, welcome! Hi, I just joined the site and wanted to introduce myself. My name is Anthony Bellipanni and I started shooting competitively back in 1993 on the Marine Corps team at Parris Island. I stayed active in the Marine Corps program and went distinguished in 2002. In 2004, I went into the Army and retired as a CW2 with 21+ years of service. Since my retirement, I’ve opened my own mail order/web based business called Distinguished Precision Shooting Sports, where I hope to provide the best equipment possible to help shooters achieve their goals. I’m still small time at this point but will be opening a brick and mortar location within the next 6-12 months. I’ve just picked up the guns again after 10 years or so spent deployed or on an otherwise high op tempo. I’m shooting a lot with the Magic City Gun Club close to Birmingham, AL; and hope to revive/grow the community in our area and the state. I have a penchant for service pistol, and shoot iron sights exclusively. I was pretty stoked by the new category announcements (Open, Metallic sight and production) since it seemed like I was always shooting guns that were substandard in the equipment race (I never had the money or time to have guns worked on). I fell in love with shooting revolvers when starting to practice for the distinguished revolver badge. So, I’m looking for a Smith and Wesson 625 and I’ll be able to shoot all production class (I shoot a 617 for the .22 and a K38 Masterpiece centerfire). 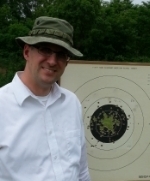 I hope to see you at the range! Welcome.I think shooting all wheel gun would be great.I would shoot my model 17 my 27 and the 25-2.Except they are not legal.There is a 6" barrel length max on revolvers for the production class.Kinda burns eliminating all the big N frames. The 617 and the 14 would be fine.And short barreled N frames,but would knock out all my oldies. Hi all, been shooting bullseye at a local club for a few years, just started taking it more seriously in the last 3 months and started reloading. Mike Liao here. San Jose native and undergraduate (about to start my 2nd year after summer) studying electrical engineering at Princeton University. I've been into firearms since I was 16 after my dad bought me a Russian SKS. I did 5 years with the Marines where I had the privilege of competing in Far East Division Matches in order to get my first exposure to Bullseye competition. I also had the opportunity to spend a range session with a local retired Marine who became a Distinguished Rifle shot during his last year in the Corps. I left the Corps as a sergeant but still felt attached to the Bullseye discipline. I have an A2 patterned AR-15 and a CMP Special Grade M1 Garand which I keep around for rifle competition. I also have a S&W Model 41 as the piece I'll probably use in rimfire. I'm currently scouring the market when I get back from college for a CMP legal service .45. I also have a Colt Officers Model Target 38 and a S&W Model 14-2 to my name which I'm considering using if I ever get into the Bullseye revolver field. Rich Konish in Wisconsin. Retired Army as well as from utility related work. Shot BE over 30 years ago on an installation pistol team but stopped with a change in duty station. Not much here for competition but that's okay; age, eyesight and arthritis have pretty much ruled out getting back into it. Just compete against myself at our local range. Do enjoy the discussions though and will kick in if I have anything useful to add.